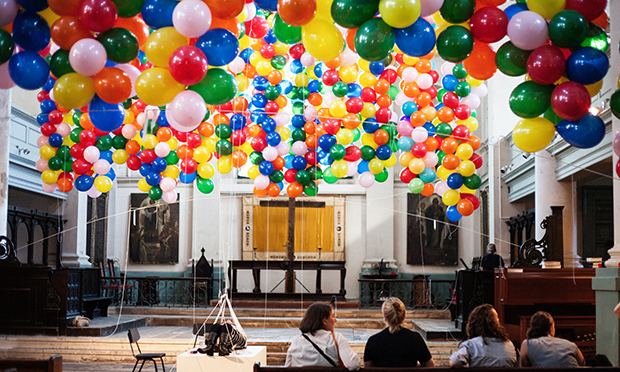 A disabled artist has been lifted off the ground by the force of 20,000 helium balloons in St Leonard’s Church, Shoreditch. 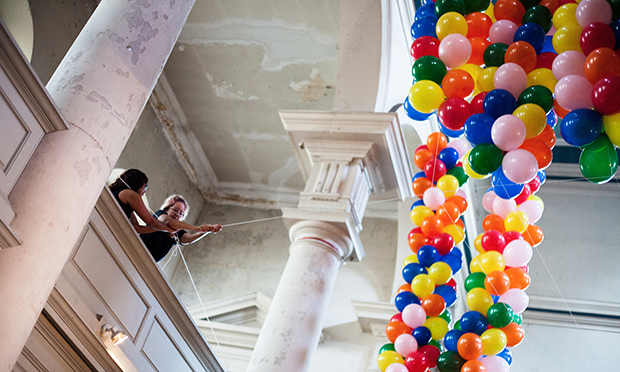 Noëmi Lakmaier, a Vienna-born artist, attempted the feat for a performance art piece called Cherophobia. 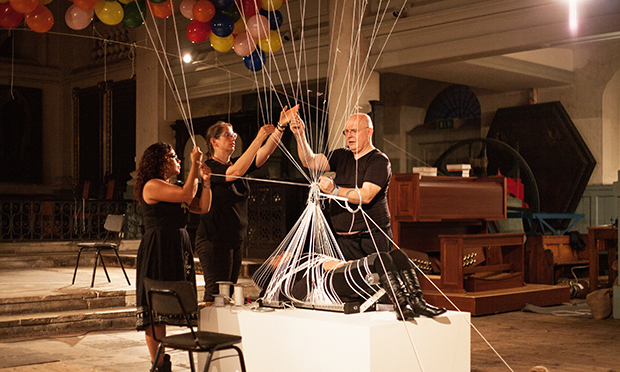 The 48-hour long performance is taking place in St Leonard’s Church, Shoreditch, as part of Unlimited, a festival celebrating the work of disabled artists. Audiences are welcome to go along and view the performance, which is also being broadcasted live to arts venues and streamed on the internet. 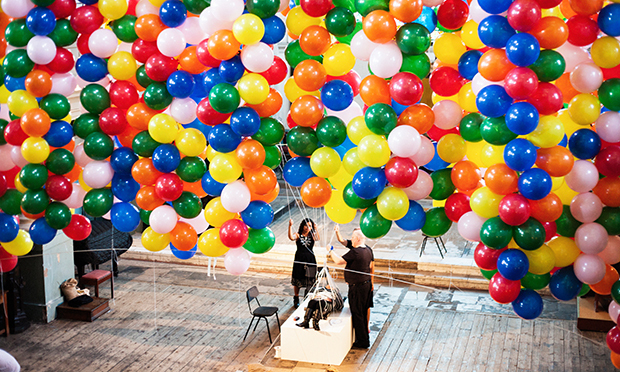 At St Leonard’s the audience will see a team of assistants inflating party balloons and attaching them to Lakmaier as she becomes suspended in the air. “I can fairly easily imagine how it will start,” the artist told Unlimited prior to the performance. “I think once we go further than that towards a middle and an end, it becomes far less predictable. 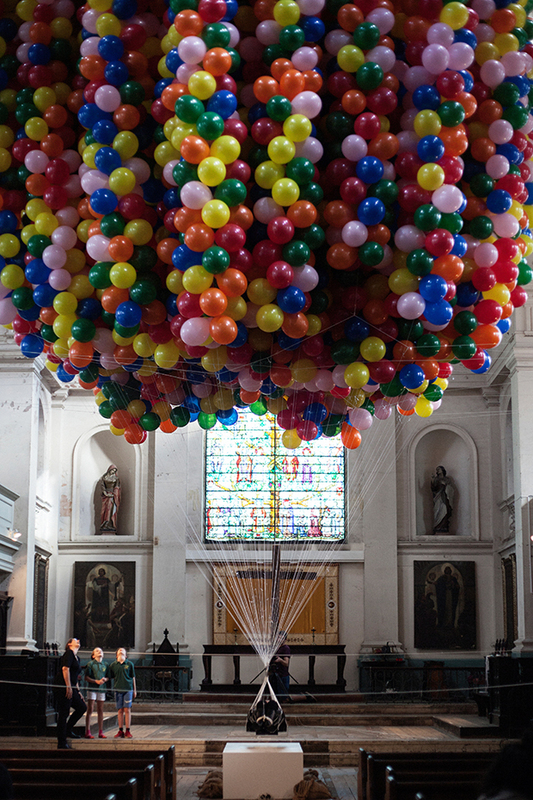 “I think it’s the whole bunch of balloons pulling upwards and the contrast to my body pulling downwards that’s the metaphor. “I suppose it’s also got a lot to do with who’s in control, because in a lot of my work, and including in Cherophobia, I put myself in a position where I’m completely out of control and at the hands of others – both my team and audience members. Cherophobia takes its name from a psychiatric condition which is defined as “an exaggerated or irrational fear of gaiety or happiness”. “I think it’s going to be quite an all-encompassing experience for the viewers”, said Lakmaier in the same interview. 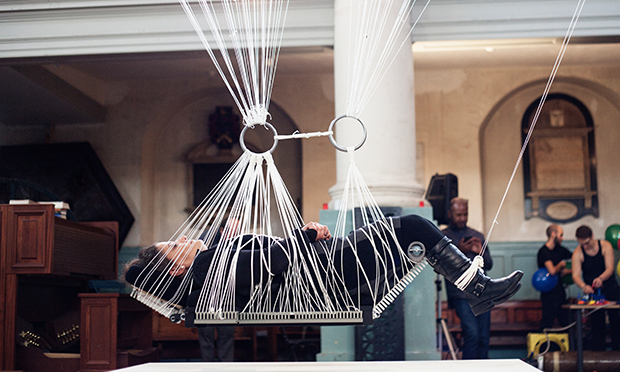 Cherophobia will be running at St Leonard’s until 12 noon tomorrow (9 September).